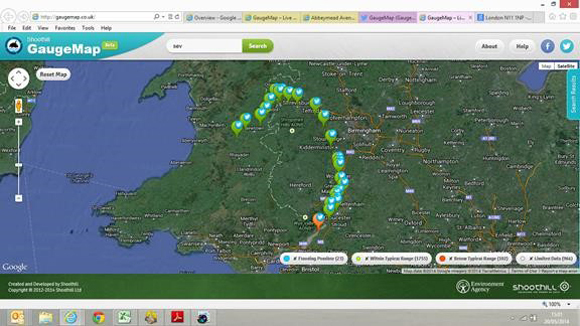 GaugeMap is a new online map from Shoothill which shows river levels across England and Wales. Shoothill created the FloodAlerts live map system now used by the Environment Agency, BBC, MSN and kayakers and canoeists seeking information on water levels. 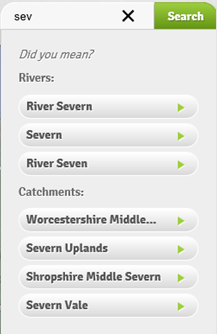 GaugeMap is Shoothill’s take on the Environment Agency’s River Levels On the Internet but in GaugeMap, over 2,400 river level gauges from England and Wales are now ‘live’, and viewable and on a single map. 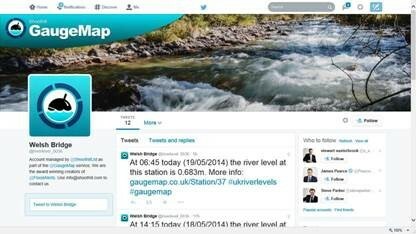 Not only that but each of the Environment Agency river level gauges now has its own Twitter account, so to see the latest status of a stretch of river, you only need to follow it on Twitter. Each ‘pin’ represents a single gauge on the map and each is colour-coded to give an instant (and holistic) view to the end user of the current state of the ALL the gauges across the entire country (blue means flooding is possible, red/brown means below average and green is normal range). 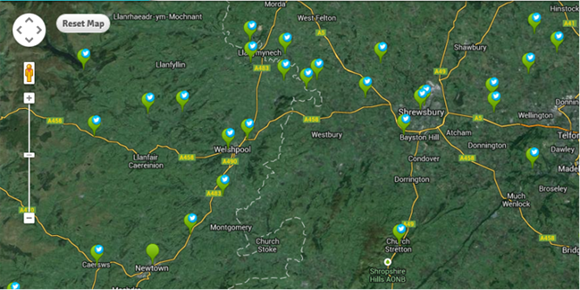 All of the Environment Agency Gauges are ‘Twitter enabled’ and this means the gauges now ‘Tweet’ their individual river levels. 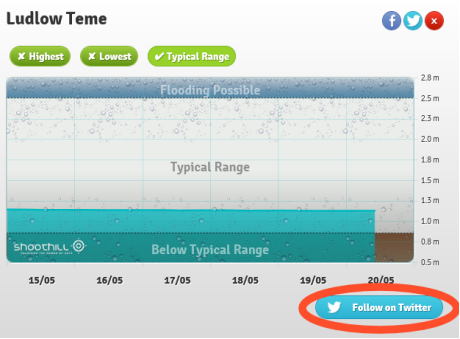 As each station Tweets its river level twice a day, you only need to follow a gauge on Twitter to be able to see the latest readings every day. Each Tweet also contains the unique URL of each gauge referring back to that gauge on GaugeMap. Each group of gauges (e.g. below average, flooding is possible, etc) can be toggled on and off on the map, so you can just see only the gauges you might want. Each gauge is loaded from within the same original source URL (e.g. www.gaugemap.co.uk/), so there is not a different page for each gauge (only an extension on the URL). So you only need the station number to get to complete the specific gauge’s URL, and once clicked, the URL takes the user to GaugeMap and opens the right gauge. Gauges currently go back for the last five days. Each Gauge is ‘Tweetable’ and ‘Like’ enabled on Facebook and Twitter. GaugeMap works on an IPad / Android / Surface devices etc.